Rick & Cathy Knapp have owned the Campground since 1991. We welcome you to experience a quiet and peaceful family campground. 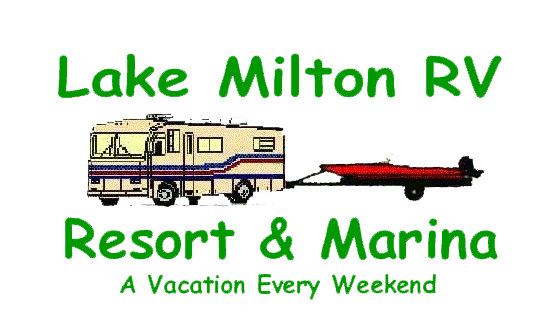 Boating, fishing and relaxing are the main attractions at Lake Milton RV Resort. The campground has outstanding views of the river, trees and wildlife. The pavilion is a great place for parties and bands. The campground has 77 sites with water and electric. Our docks are accessible to Lake Milton from the river. We have our own private boat launch. Our campground offers a unique place to camp and enjoy a comfortable stay! Lake Milton offers the best in water-related recreation, boating, swimming and fishing. Boating is popular at the lake which is designated for unlimited horsepower. The scenic shoreline provides a habitat for waterfowls and shorebirds for all to enjoy. Lake Milton has a new 600-foot beach with restrooms, change booths and showers. The lake was stocked with walleye, largemouth bass, bluegill, crappie and catfish. The river is a no wake area with great fishing.